We officially listed our house on the market, and I wanted to take a moment here to reflect on this journey of first-time home ownership. 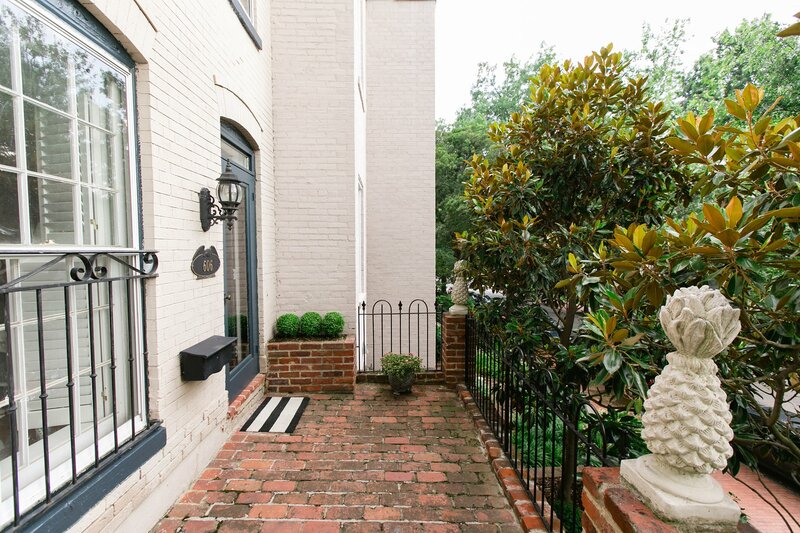 I’ve had so much fun over the past five years making our Capitol Hill row house a reflection of us. All the little decisions are what truly make a house a home. From researching the perfect shade of grey for our walls (Benjamin Moore Stonington Grey is tops in my book), to finding the amazing knocker I had been searching for for years (read the international story below), to the hours of labor that went into turning our backyard into a comfortable entertaining space – it has been an incredible experience I will never forget. I will always love this little home and all the memories we created here. 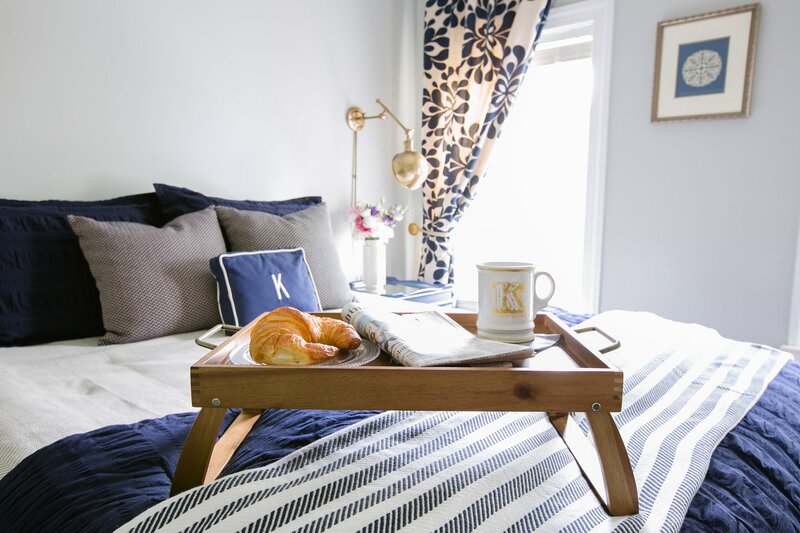 As an event designer, often times I approached my home design the same way I work with our clients – setting priorities, sticking to a budget, and being open to an organic design plan that never feels too matchy-matchy or forced. I believe the best designs are ones that unfold naturally. 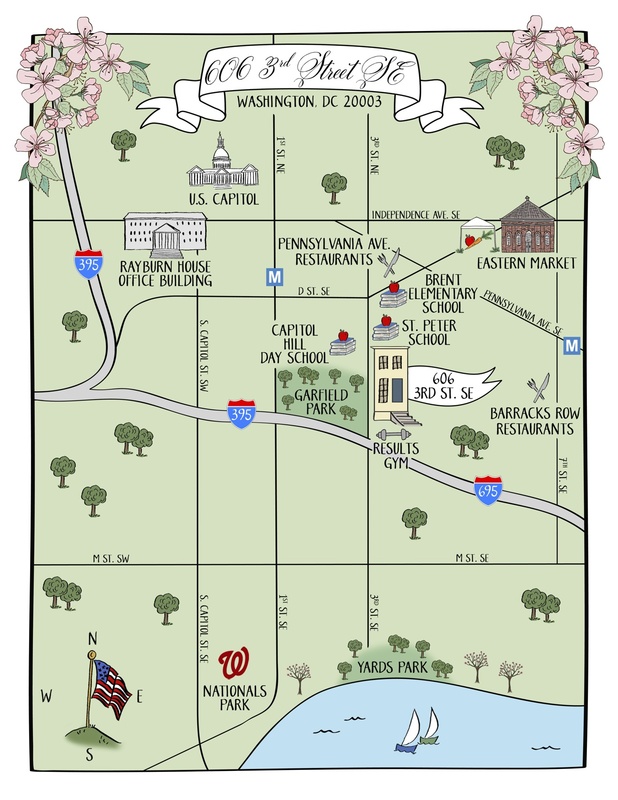 When my husband and I went looking for our first home, we wanted to be in DC proper (no suburbs for us!) and Capitol Hill was the perfect fit. 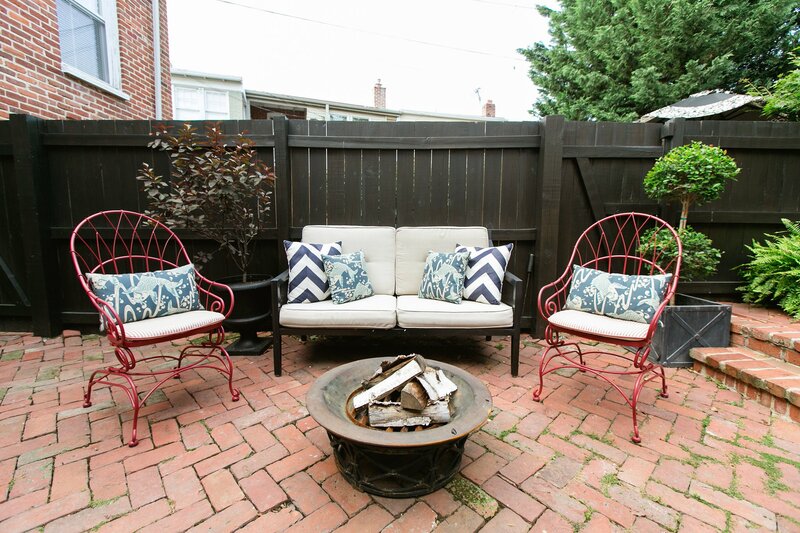 It is in the city, but still has a neighborhood community feel we wanted. 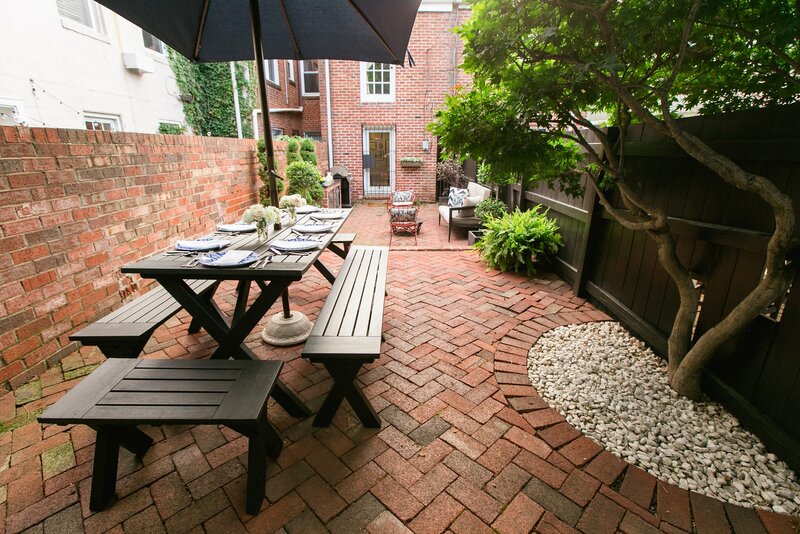 We can walk to the wonderful restaurants at Barracks Row and Pennsylvania Avenue, Eastern Market, Washington Nationals baseball, and the U.S. Capitol. 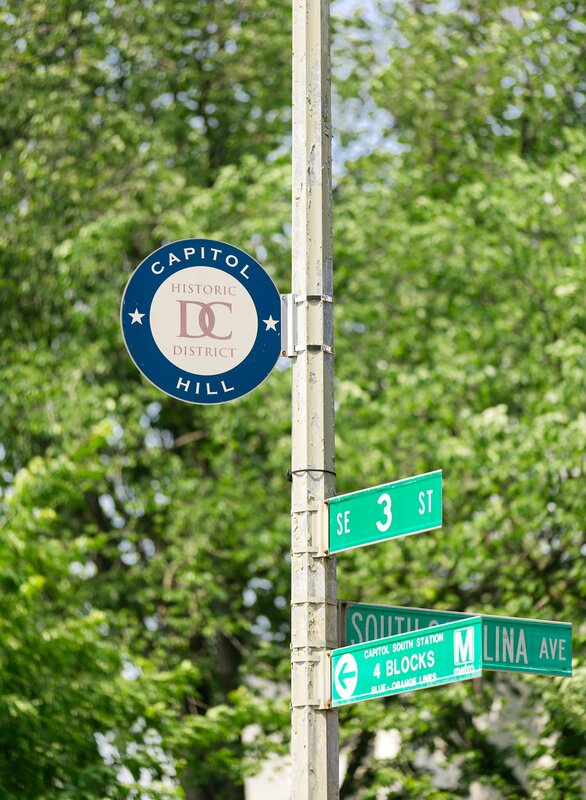 Being in the city is unlike anything else and Capitol Hill is such an incredible place to live! Our house sits atop a hill overlooking Garfield Park in the historic district. We're pretty spoiled with one of the best locations on the Hill! I love the pineapples that greet us at the top of the terraced front garden and brick staircase. Pineapples are a true sign of southern hospitality. Our front 3-tiered terraced garden includes daffodils, tulips, hyacinths, allium, boxwood, poppies, iris, ferns, hydrangea, poppies, seven (yes seven!) 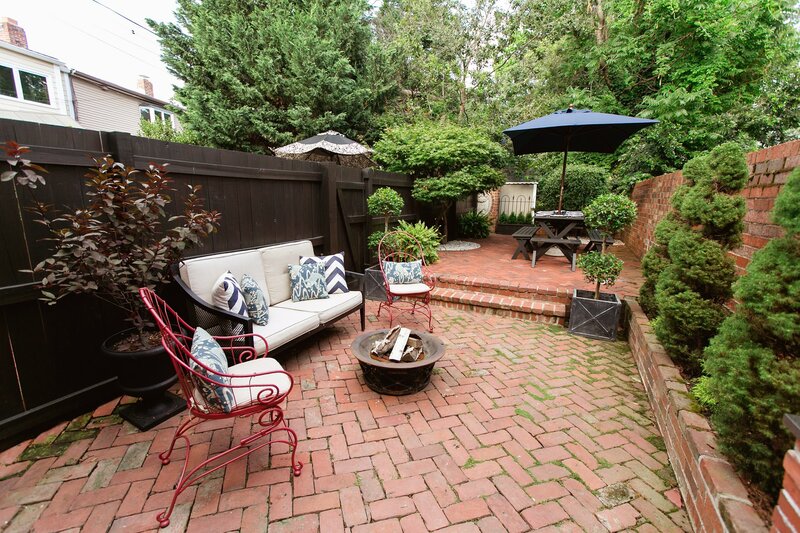 peony plants, two magnolia blossom trees and more! I love how this garden has provided daily beauty and inspiration to send us off into the day. Always take time to stop and appreciate these gifts that are all around us. Our front door seemed to be missing something. For the first few years I walked around our neighborhood longing after the great knockers everyone seemed to have on their doors - foxes and dogs and all sorts of other wonderful metal wonders. 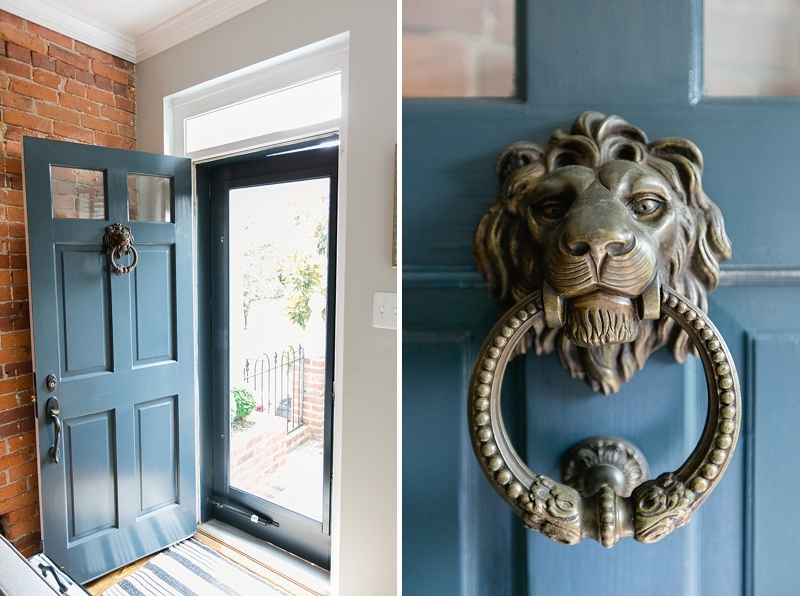 I love lions in home design, and for some reason, always envisioned this house having a lion knocker. But the reproductions I found were never quite right and I thought one day, I'll find what I'm looking for. I'm never the type to say - we need a knocker, let's find the best knocker - and settle. I'd much rather wait for something that speaks to me. Well, I had just about given up on every finding "the one" worthy of our door when I traveled to Portugal for an event in 2012. We weren't really shopping, but decided to pop into a small antiques shop. Sure enough, there it was - an beautiful bronze lion head knocker from the 1800s. Can you imagine all the people that have passed through the doors this piece has seen? The folks I was with thought I was a little nuts for lugging that thing back to the U.S. - it is HEAVY - but I gladly paid my overweight baggage fees and have cherished it ever since. It is the just the jewelry our little house needed. It reminds me every day to have patience, and that its okay to not know what you're looking for always, but when you find it, you'll know. We share a cute little pass-through to our backyard with our neighbor Chris. We could never dream of having a better neighbor, she's amazing and I'm really going to miss her and Poppy. But before we go out back, first, let's check out inside! 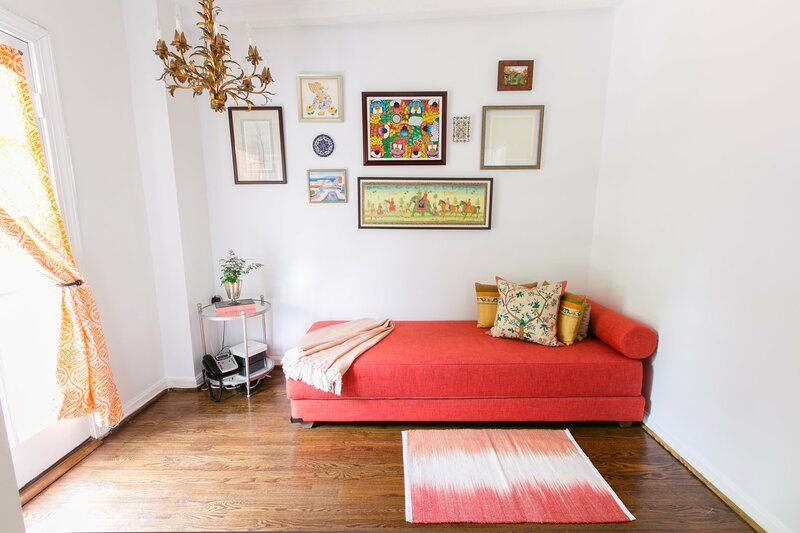 I love the look of mixing vintage pieces in with new furniture. Added bonus to antique finds? 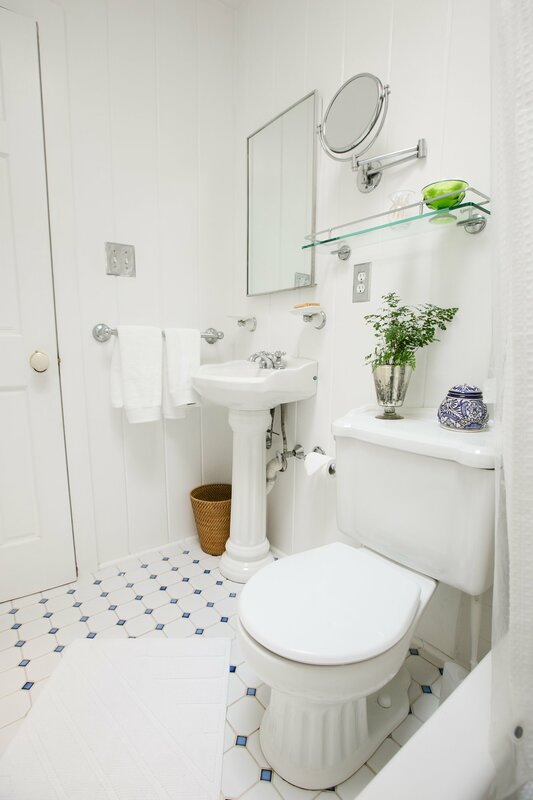 They tend to be a little slimmer and the scale works oh so right for Capitol Hill smaller space living! In my search, I stumbled across a listing on Craigslist for a purple crendeza. Purple? 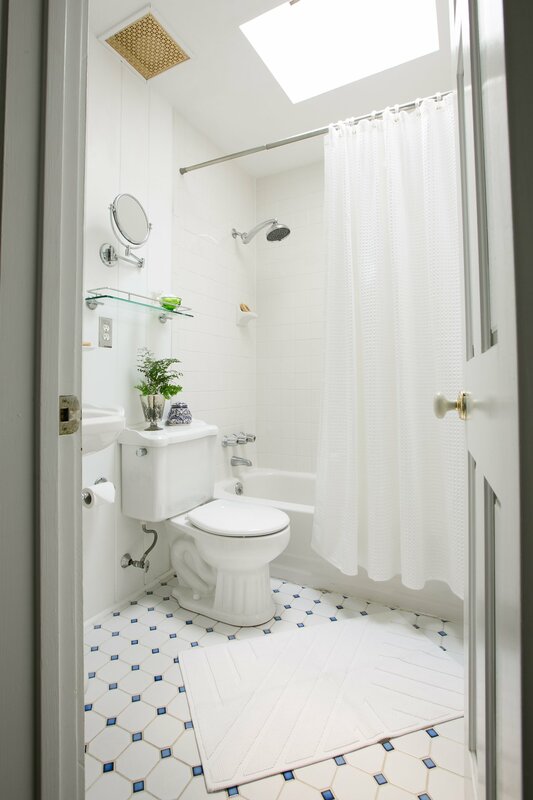 Wasn't what I had in mind, but I loved the shape and the measurements were PERFECT for this little space. I could always paint it, right? I contacted the couple, who also lived on Capitol Hill, and made arrangements to see the piece. When I visited them, they told me how much they loved it, how special it had been in their first home, and while they hated to let it go, they wanted it to go to someone who loved it just as much as they did. I made them a promise that I most certainly would love it. Adam was traveling abroad for many weeks at a time that year, so I had no way of getting it to my house on my own. The sweet couple not only helped me move it across town, but up our stairs and into our new home. I remember thinking, man, I love Capitol Hill. These people are so nice. This neighborly act of kindness is something we all take for granted now, those of us who have lived here a while. But it is special, and we must always remember the ability to we have to make someone else's day. 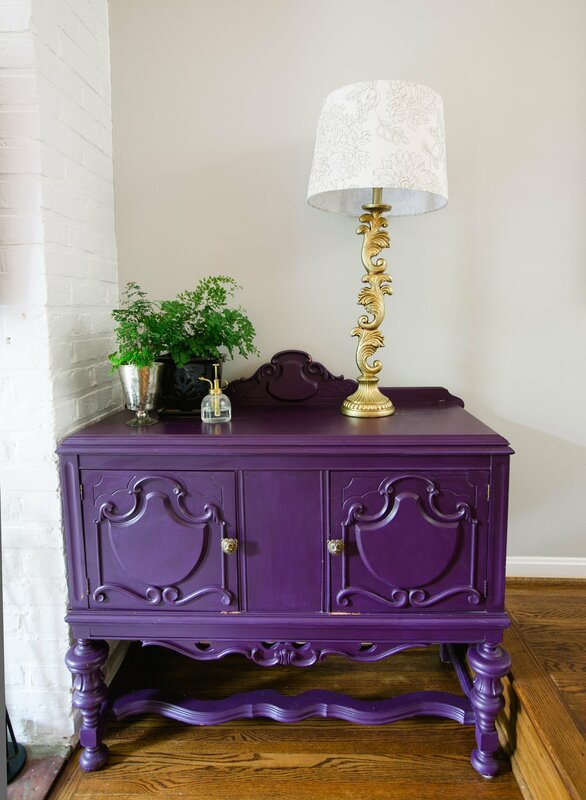 Back to the purple piece -- when I placed it inside our new home, it fit so perfectly and I was so humbled by their kindness towards me, I decided to honor the O'Neils paint decision and keep the color. Now I can't imagine it any other way. I certainly didn't set out to find a purple piece, but I'm so glad I did. A quick refresh of the knobs - to lion heads, naturally - put a little of my stamp on this piece. I think that's where this lion obsession started now that I think about it! This piece may end up in our new California office, and maybe, just maybe, we'll refresh it… stay tuned. 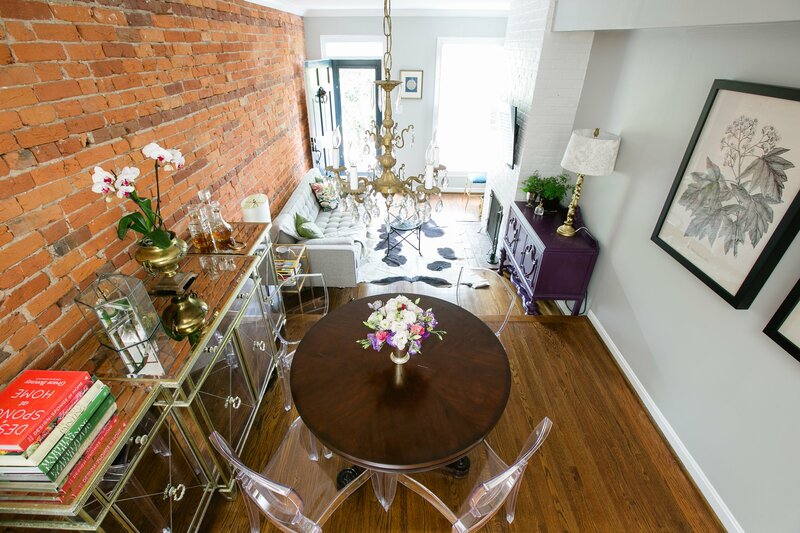 We decided on a chandelier over the dining table would be so much more appropriate and beautiful for the space than track lighting. I found this one in California, and luckily Emily (who lived there at the time) agreed to meet the sellers and help ship it to me. 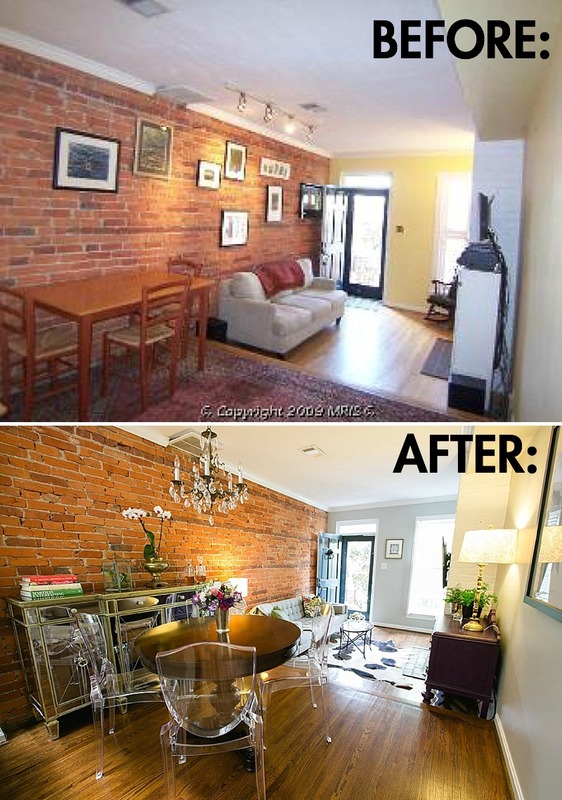 I love the way it reflects the light and looks against the exposed brick wall. 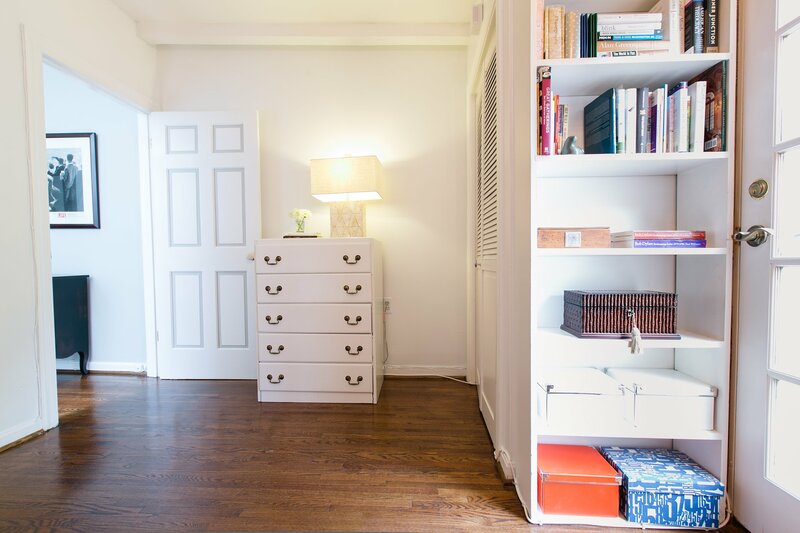 We kept our furnishings clean and simple, with a few key statement pieces. 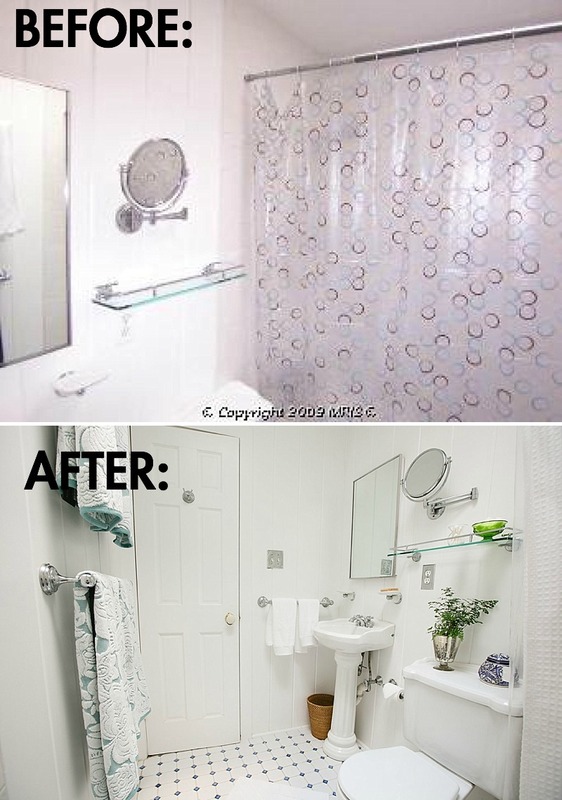 Don't be afraid to have a few bigger pieces even in a small space. Our oversized tree artwork, mirrored crendeza, and lamps are all purposefully big. I selected clear aryclic chairs to keeps things open around our Mitchell Gold+Bob Williams table. What can I say, I LOVE this room. It is one of our biggest accomplishments. 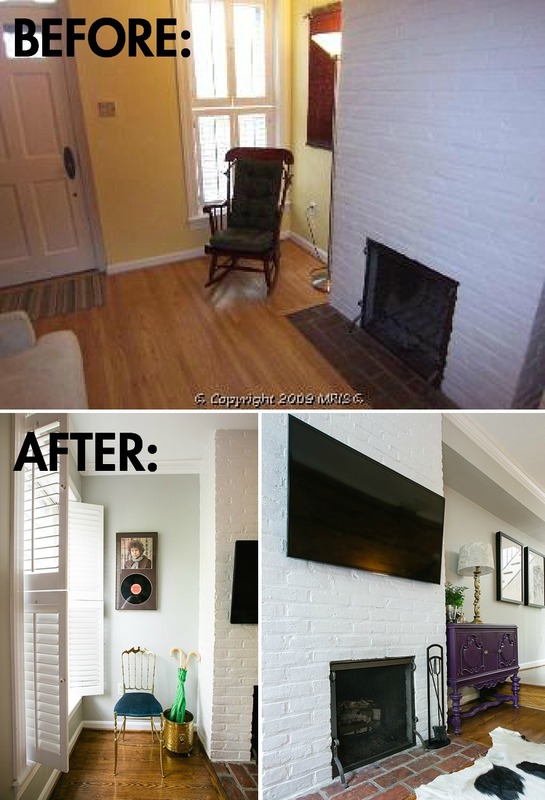 What was once an eye sore is now a bright cheery room, that is also soooo much more functional than before. 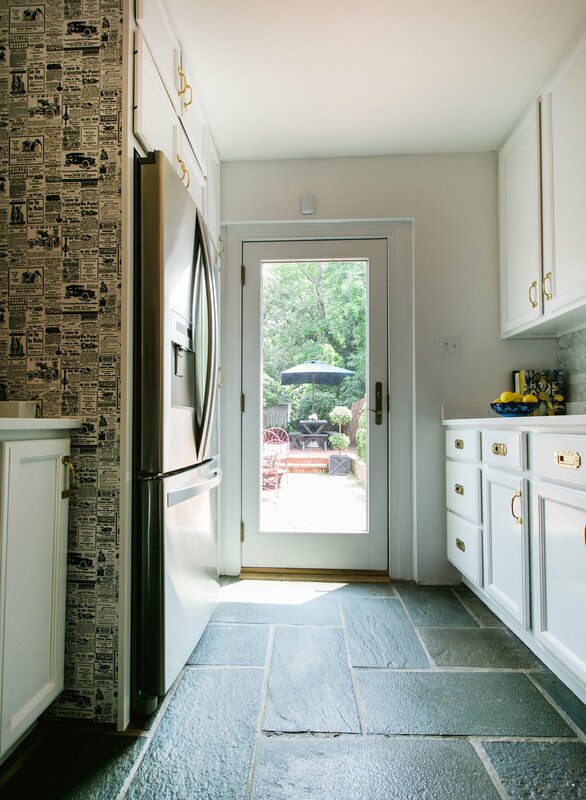 We replaced faux mosaic fruit tile (yes, you heard that right - "faux mosaic fruit") with a small scale carerra marble subway tile. 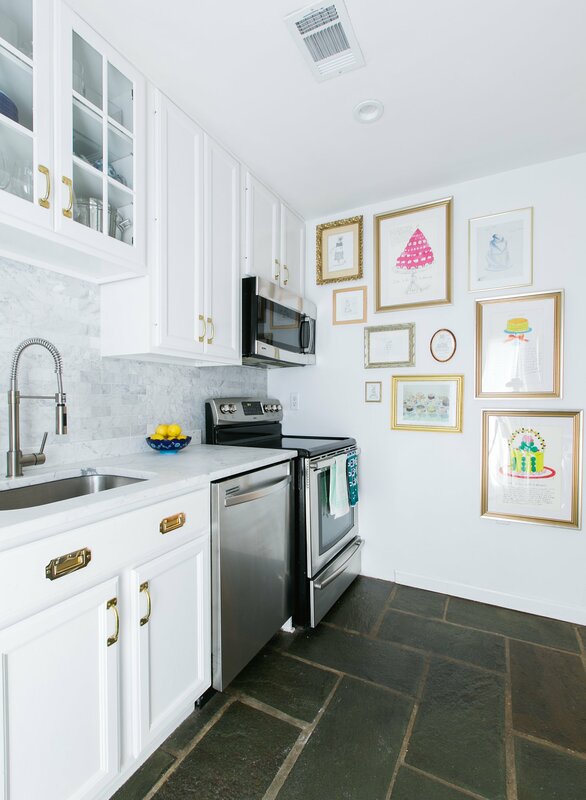 The Cararra marble counters and the brass hardware campaign pulls are two of my favorite design details. 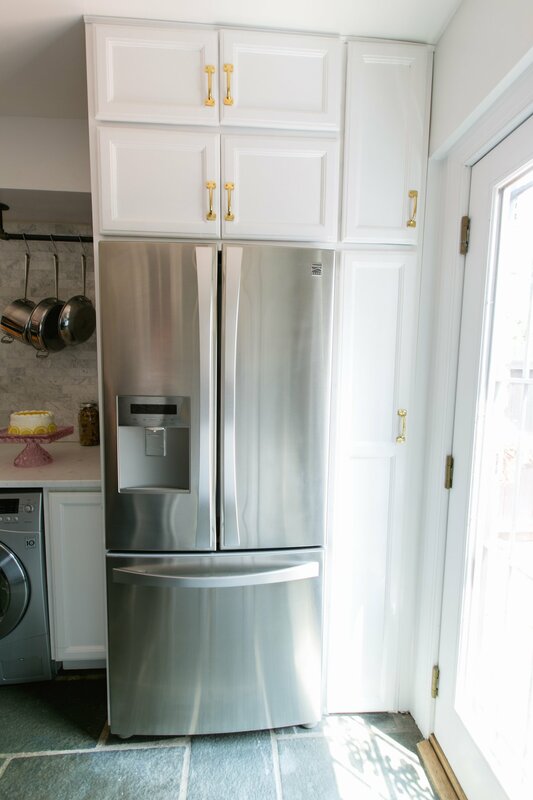 We also added a second counter by reworking cabinets on one side of this galley and switching to a washer/dryer combo unit. Now, we have a fabulous deep second surface to prep food, fold laundry, display all the cakes I bake from scratch (fingers crossed behind my back) and an area above to hang our All-Clad. 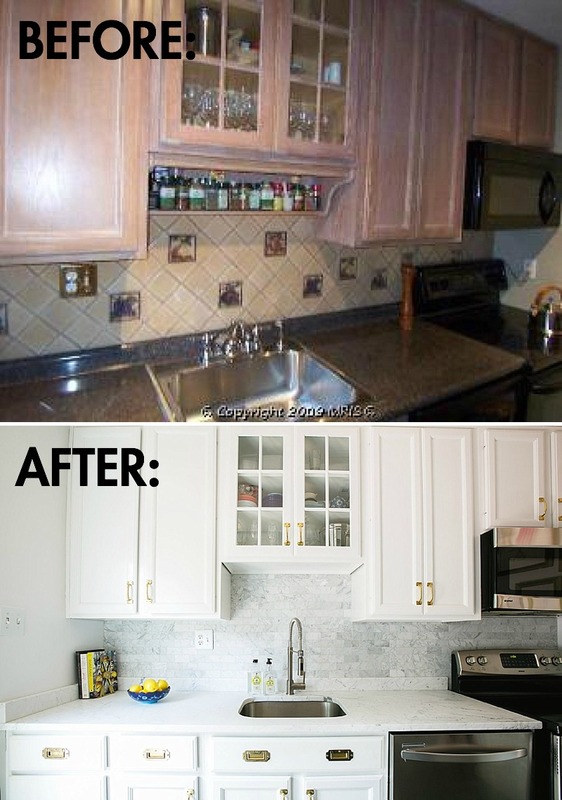 Most importantly, you aren't staring into the side of cabinets when you look in from the living space. 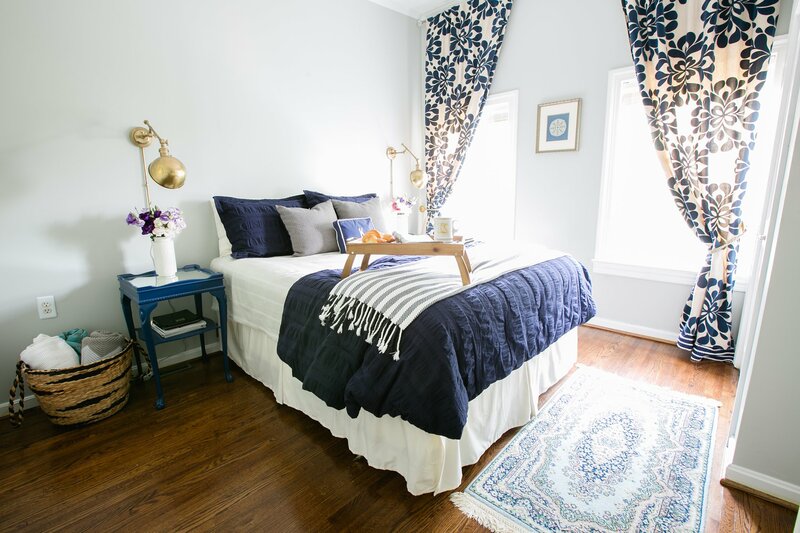 I wish I could take all the credit for this room, but my husband Adam was the amazing space planner who sketched and re-sketched until we got the room's bones just right. The transformation is incredible and is a testament to his hard work. It is hard to pick a favorite detail in this room. I love the convex Federal Eagle Mirror - I had always wanted one since moving to the East Coast and we picked up this mirror last summer antiquing in the Finger Lakes region of New York while visiting for a friend's wedding. This mirror seems a little unexpected in a kitchen which makes me love it even more. 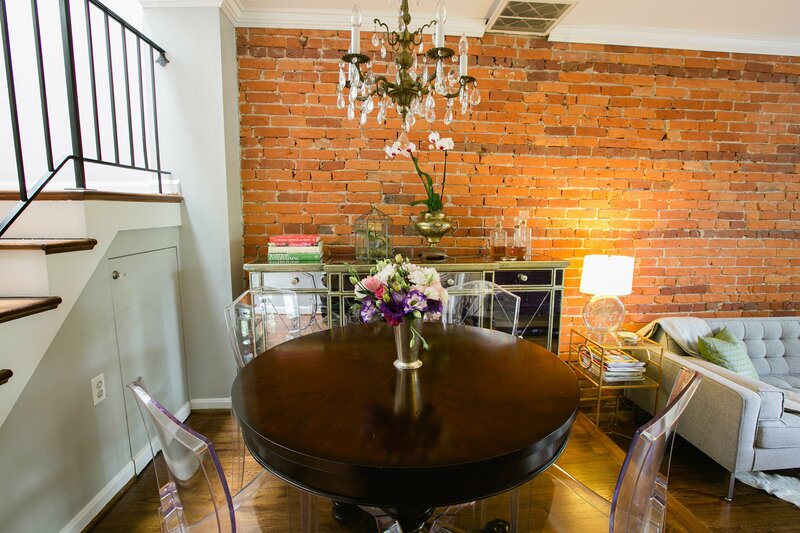 (In fact, we just designed a wedding last month using these mirrors as inspiration - stay tuned for that stunner!) 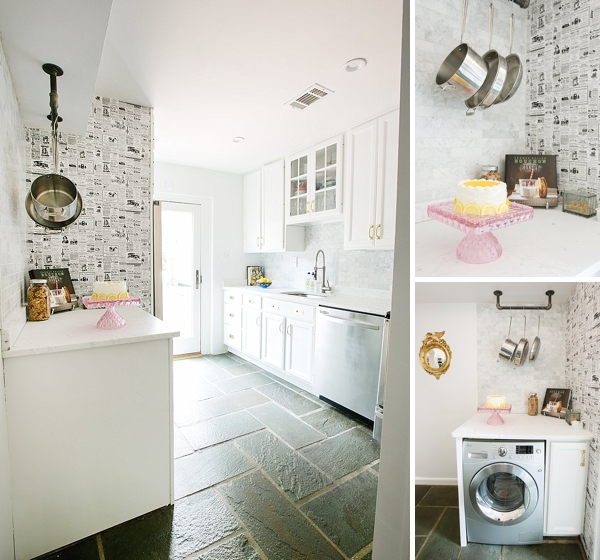 However, if I had to choose just one favorite detail, it might be the cake wall. This is something I had dreamed of for a long, long time. 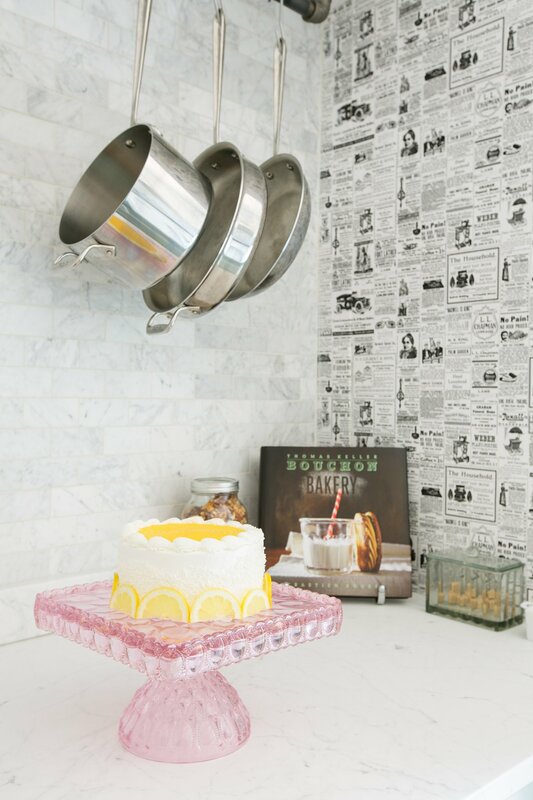 I have a tendency to get an idea and become obsessed with it, and this cake wall idea was definitely one of those! 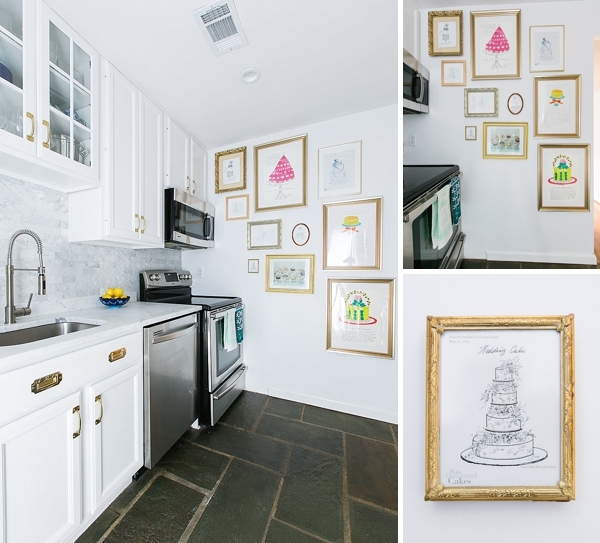 It started with a few framed Andy Warhol prints I purchased on One Kings Lane and held onto for years, hoping to one day hang them in the kitchen. Then I decided I wanted to one day have a wall full of the pretty cakes. Why not - I love cake, I'm a wedding planner, and cakes in a kitchen just make sense to me. I'm lucky to be surrounded by fabulous artists, and a few of my favorite cake bakers sketches are now included in my gallery. Do any of my clients spy their cakes? There is also a Thiebaud print mixed in there too, because it seemed wrong to have a cake wall without Thiebaud! The wall includes baker friends Jim Smeal, Ron Ben-Israel, Maggie Austin, Silvia Weinstock, Charm City Cakes, & T-Bakes. Love all of you and so thankful to have your art adorn my wall! Adorable, right? Shall we head out back? 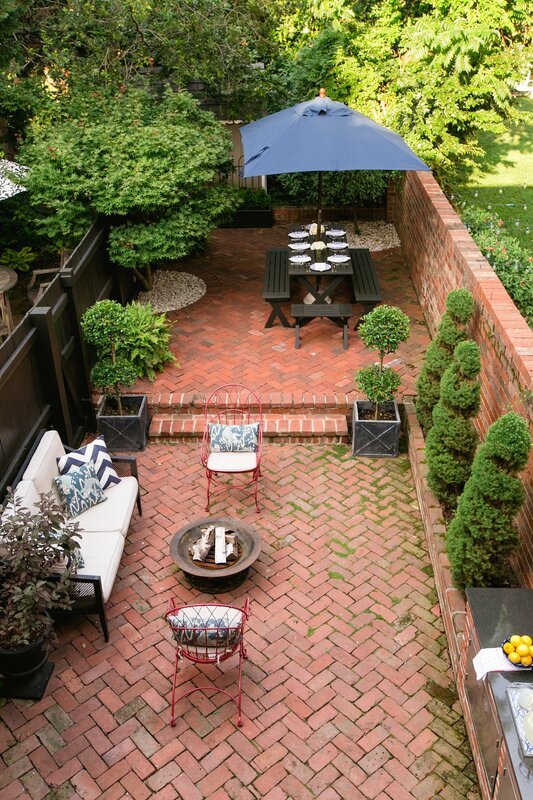 This backyard is an entertainer's dream. I regret not inviting more of you over more often! 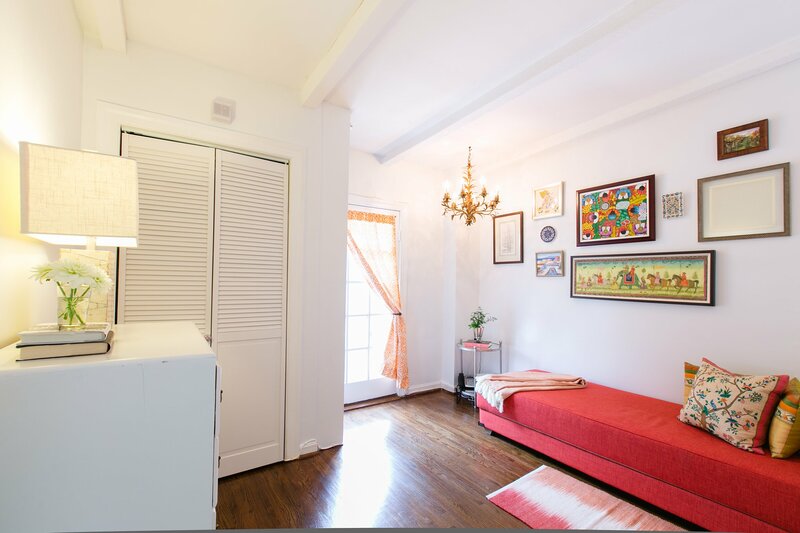 For Capitol Hill two bedroom homes, this amount of space is very rare, so we feel very lucky! 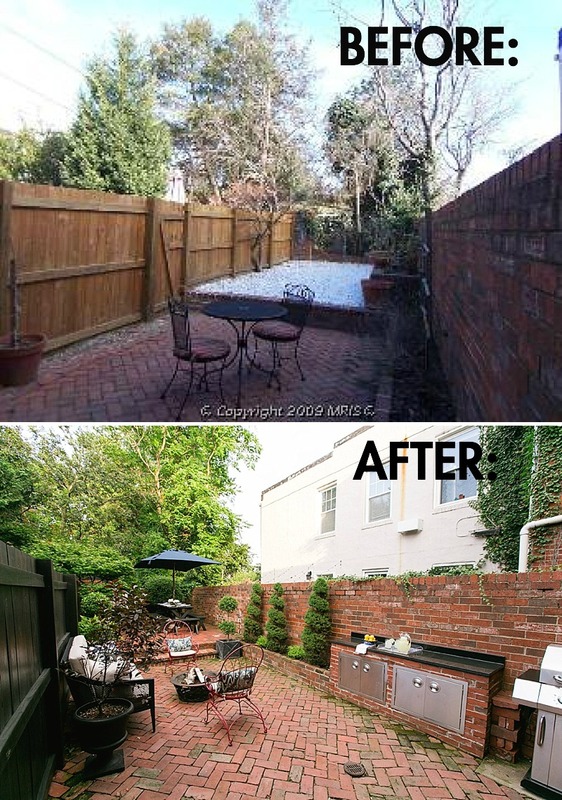 The backyard we started with looked so very different. 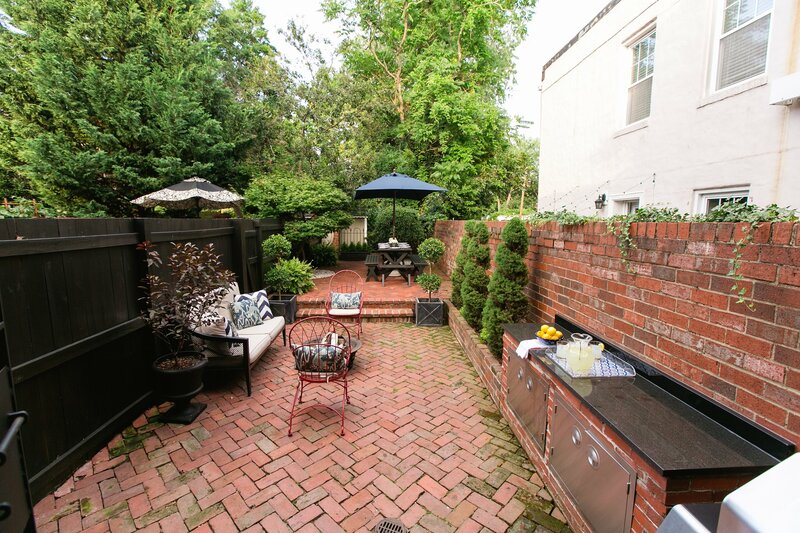 We added the granite counter/storage, steps, landscaping, stained the fence, but the biggest change was laying brick in the second half of the yard - formerly white pebble. The two tones felt to chop the yard in half and make if feel much smaller than it was. 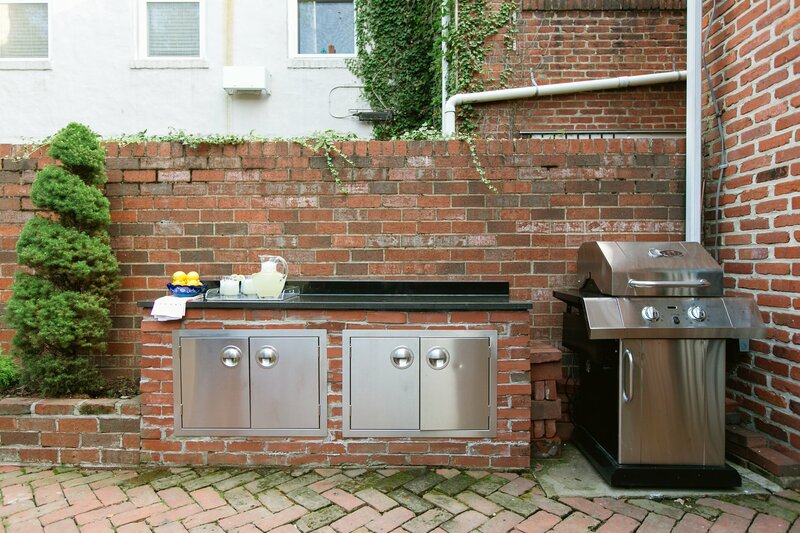 To unify, we knew we wanted brick vs. any other material we considered. I love the look of the old original brick, and after quite a bit of research, found bricks that were formerly part of the Annapolis Pier. 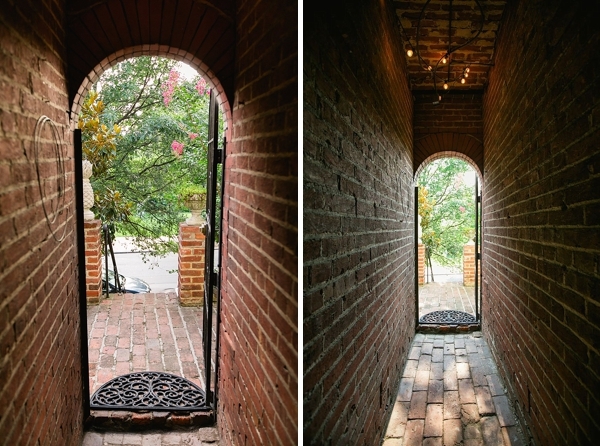 We love that there is a little bit of Annapolis history here in our backyard. Adam, his brother and our friend Andrew painstakingly laid each brick by hand, leveling along the way. It was quite a task but it turned out amazing! 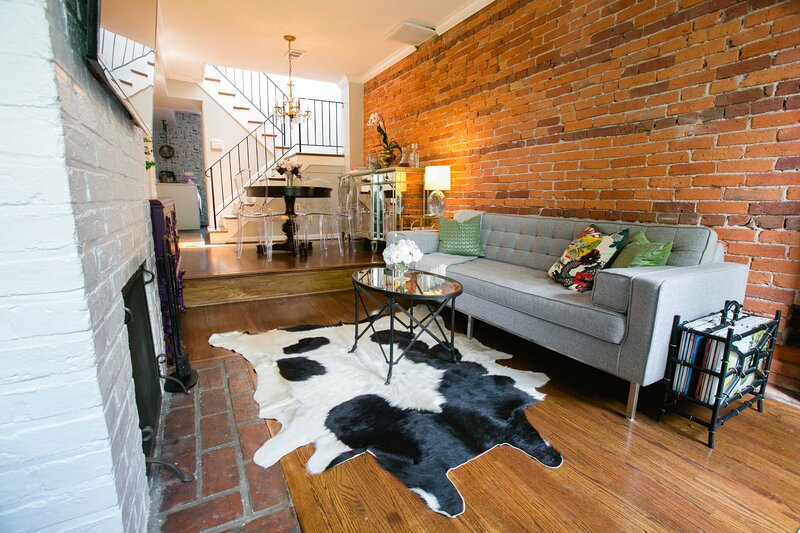 Want to see our upstairs level? Do the doors look familiar? 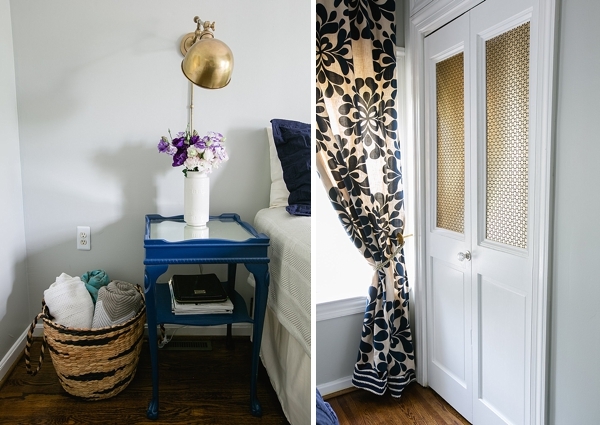 We loved the way these perforated metal closet doors turned out so much here in my bedroom, we decided to replicate the look when we moved into our DC design studio! And those curtains - from Anthropologie - still love them after all these years. Huge thanks to my BFF Buffy for helping me sew the custom trims! Bedroom #2 overlooks the backyard. 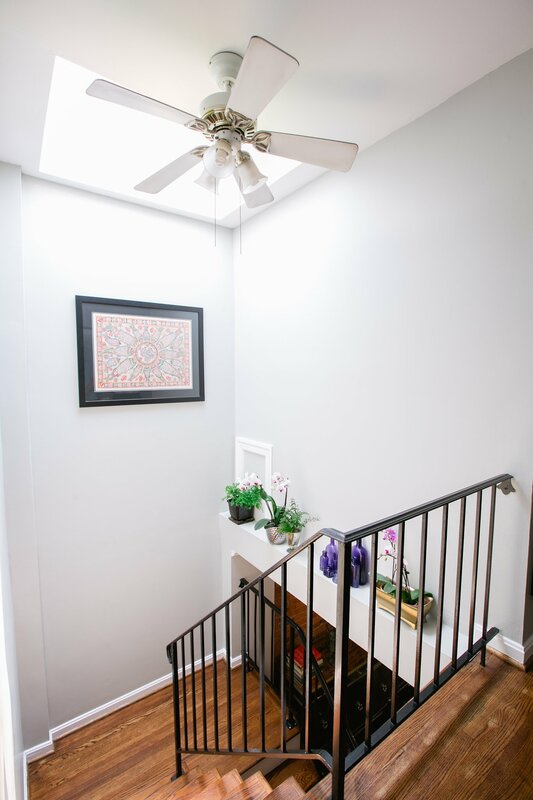 The gallery wall includes a collection of art from places we've traveled, and the chandelier is one that I coveted from my brother-in-law's Capitol Hill home. When they moved last year, they gave it to me. Isn't it great?! 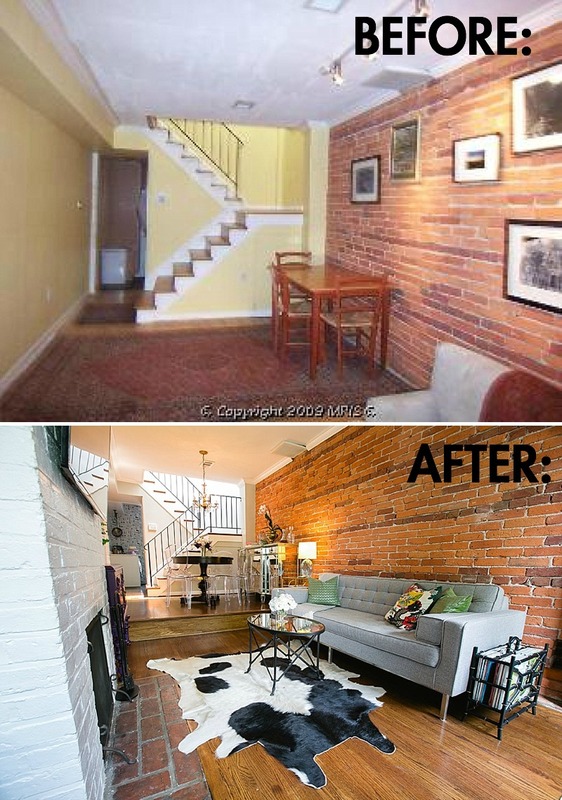 I so hoped you've enjoyed "touring" my home - the pictures, the stories behind the pieces and the before-and-after pics! It goes without saying that I am very sad to leave our first home, but I do hope that I'll get to do it again one day soon. Home ownership is a wonderful responsibility and I hope the next owners will love and appreciate each detail here as much as we have. I cannot thank my friends Jodi & Kurt with Jodi Miller Photography enough for all their time spent taking gorgeous pictures of our house last weekend. Thank you!! And to Fred, with Frost Lighting, for helping string lights in our backyard for the broker's open this evening. It has never looked better! And to Laura Hooper Calligraphy for creating the custom map for my listing below - thank you!! Our house will be open this Sunday from 2:00 PM to 4:00 PM. Please feel free to stop by and take a peek! 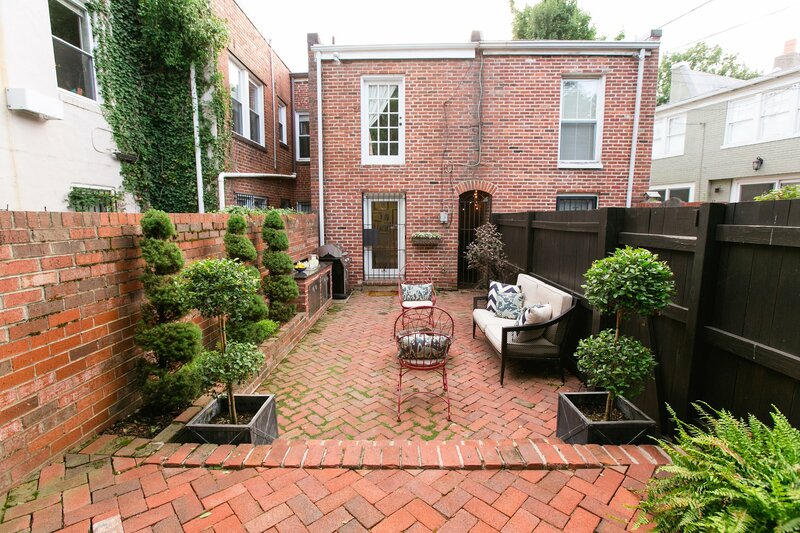 And if you know anyone looking for a 2 bedroom on Capitol Hill, look us up! I kind of wish I was looking to move to DC, I’d love to live there. DC would be lucky to have you!! 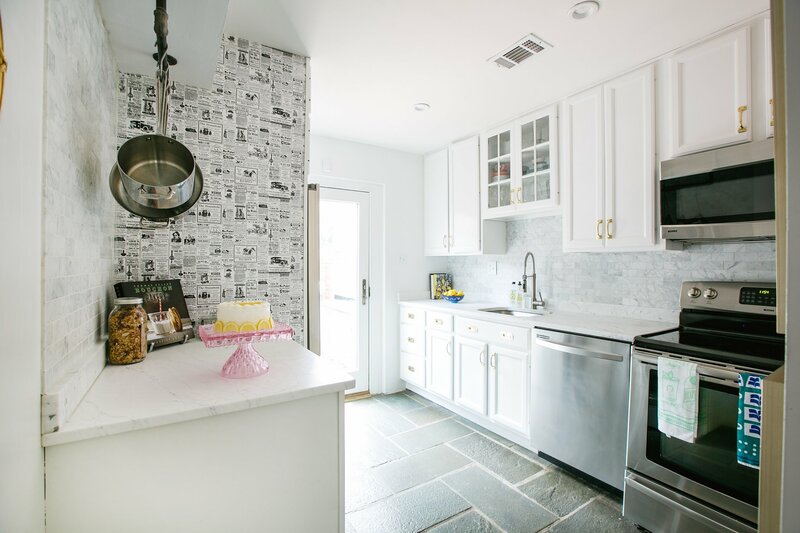 I loved this home so much when I visited you and it looks even more amazing now. Such special work, a journey no doubt, that really shows in the final, stunning product! Great job!